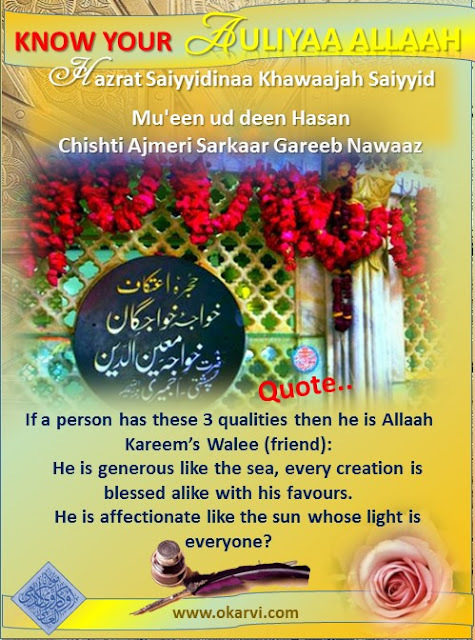 He Is A Beloved Of Allaah Kareem Who Died In The Love Of Allaah [Ta’aalaa]. 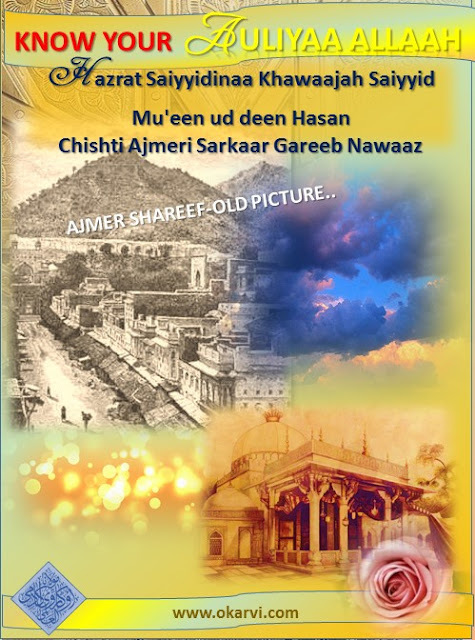 He was buried in Ajmer and his blessed Mazaar is present up to this day. Many Karamaat’s emanated from him and millions are his devotees, being disciples of his disciples. Many relics have been preserved. 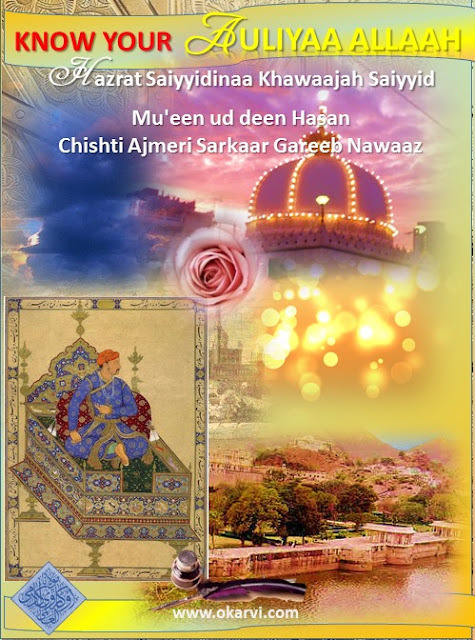 King Auranzeb Alamgeer being the king of Hindustan, visited the blessed Mazaar four times, journeying on foot. 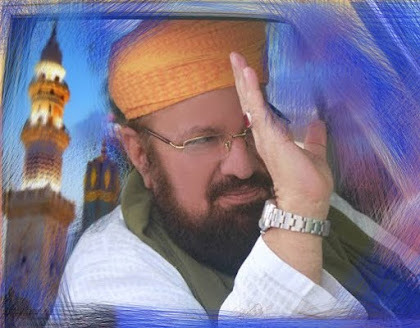 On his way to the Mazaar Shareef he made numerous donations and gifts to the poor and needy. 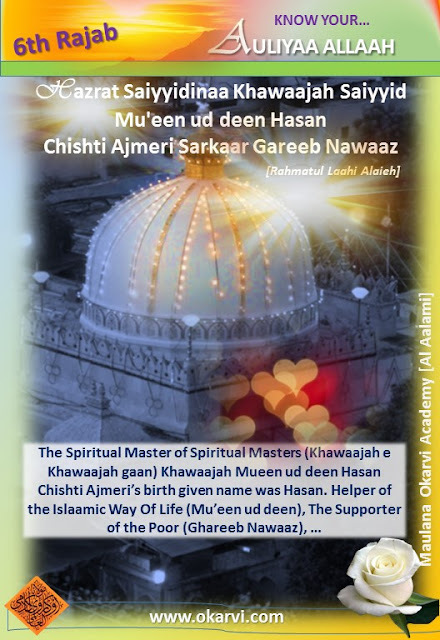 Jahaan Araa Begum, the daughter of Shaah Jehaan, a great devotee of Khawaajah Saahib came to the Mazaar and at each stop she read two chapters of Qur’aan, Soorah Yaaseen, and Faatihah; and donated much to the poor and needy. When King Jahangeer came to the Mazaar Shareef but 2 miles before the mazaar he walked out of respect and reverence of Khawaajah Saahib. He gave much to the poor and needy and of the two huge pots used for cooking up to this day, the smaller was his gift to the Dargaah premises. Shaah Jehaan built the Marble Mosque and Sultaan Mahmuud Hindi built many portions of the Dargaah. Many kings came and left remembrances of their visit. Of the two huge pots, Mughal Akbar donated the biggest. All these gifts are preserved up to the present time. The supreme remembrance is the lesson to future generations, how The People of Almighty Allaah lived and how they propagated Islaam. The lesson of how amidst Polytheism (shirk) and Misbelief (kufr) the lamp of Islaam was lit. 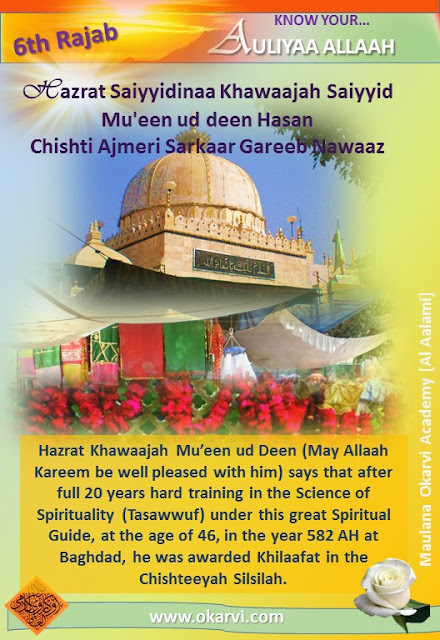 Khawaajah Saahib’s status is so great that he is the King of the Chishteeyah Spiritual Order. His spiritual benevolence blessings flow up to this day. Remember these people do not die, but are freed of physical restrictions and their spiritual benevolence and blessings get stronger. Allaah Kareem willing their spiritual benevolence and blessings will be with us till the Day Of Reckoning. This is a separate topic but remember that the Tasarruf [Free Disposal or dispensing. The Perfect Man governs the affairs of the world and controls them by means of Divine Names. This is attained through directing of his spiritual energy.] That they attain from Allaah Kareem as I explained in previous lectures in which Almighty Allaah says, ‘I become their hands etc.’ then their physical senses and power becomes unlimited, though dependent on Allaah Kareem. Tell me is this excellence of theirs Spiritual (Ruhaani) or physical (jismaani)? If your answer is Spiritual (Ruhaani), which is correct, then tell me does the Spirit Or Soul (Rooh) die? No! Death is the separation of the soul from the body. If the soul is so powerful within the cage of the soul then how powerful must it be after being freed from this bodily cage? Those that say Auliyaa Allaah are dead and their power has ceased are themselves dead, for the people of Allaah [Ta’aalaa], never die. 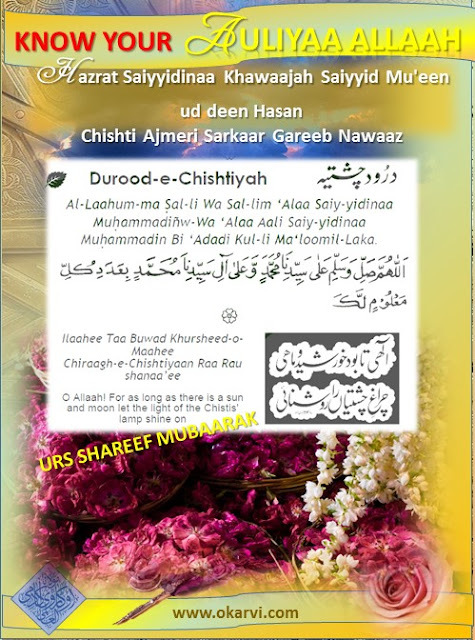 The Lovers of Allaah attain eternal life. Remember their tasarrufaat increases after death. Khawaajah Saahib is one such Walee whose ability to change conditions (tasarrufaat) exists to this day and will be so forever. Hazrat Ghaus Al-A’zam, Hazrat Bahaa ud deen Naqshbandi and all these great Auliyaa Allaah are alive and interfere in constitution up to this day and will, God willing till eternity. Believe in them and love them. Their love is the essence of faith and a means of salvation. Are the Auliyaa Allaah in this category of blessed ones or not? We ask in five salaah that Allaah (Almighty and Glorious is He) should keep us on their path. Keep on their path, methodology and pattern of belief. These Spiritual Orders ushered in the correct belief so keep on this path and do not be fooled by the distracters. We will send salutations on the Holy Prophet (Peace be upon him, his family and his companions), pray to Allaah Kareem and present ourselves at the Mazaar and, as Maulana had mentioned, we will present our gifts. Ram Deo, now Abdul laah informed Khawajah Saahib [Rahmatul Laah Alaieh] of impending danger from the enraged king and his followers.. Allaah [Ta’aalaa] had given them respect so none could disgrace them. Nothing could swerve Khawaajah Saahib because Allaah [Ta’aalaa]’s Divine Help was with him and the Look of Blessing of the Holy Prophet (Peace be upon him, his family and his companions). He was sent by them to purify the place of polytheism (shirk) and misbelief (kufr). Abdul Laah told Khawaajah Saahib that he had inherited some land, which he owns and he gifted it to Khawaajah Saahib. He said that they could build a Masjid and Khanqaah on this land to use as a base for propagating Islaam. Khawaajah Saahib agreed and thousands of his followers helped to build a Masjid and a few rooms. The teaching of the Holy Qur'aan, gatherings of zikr and lectures was started and people flocked to the Khanaqaah and accepted Islaam. The king now said that the greatest Hindu magicians should be commissioned to challenge Khawaajah Saahib and in this way they could discredit him as another magician. He is affectionate like the sun whose light is everyone? He is hospitable like the earth, which is hospitable in exactly the same way towards all. So much of damage caused by sin has never been seen, as much as the damage caused by a brother being disrespectful and despicable towards another brother. Khawaajah Saahib and his followers pronounced the Call to Prayer (azaan) five times daily and performed salaah in jamaat. Nearby there was a lake called, Anaasagar where they performed their ritual ablution (wudhu). The center of misbelief and idol worship daily heard the proclamation of the Unity of Allaah [Ta’aalaa] [Tauheed] and the Divine Commission of the Holy Prophet Muhammad [Sallal Laahu Alaieh Wa Sallam][Risaalat]. People used to come out of the temples and homes curious to know what is being announced when the A’zaan was called. Seeing the congregation prostrating invoked questions as to whom were they prostrating since no idol was in front of them. Seeing this five times daily and hearing the Remembrance Of Allaah (zikr) had such an effect that the audience themselves stated reciting ‘He Is The Truth’ (Haqq Huu). Many came and joined the circle of Khawaajah Saahib and the spreading of Islaam commenced. Many accepted Islaam just by seeing the God given beauty and exemplary character of Khawaajah Saahib. Almighty Allaah’s Divine Assistance was with him and the look of grace from the Holy Prophet (Peace be upon him, his family and his companions), since he was Divinely Commissioned for this mission. The King got word of the effect he was having on the masses, the fact that the Hindu Holy Lake, the Anasagar was being utilized for ceremonial ablution (wudhu) and meat was being consumed in full view of Hindu vegetarians. Above all this king was more furious that the Hindus were accepting Islaam. He was determined to get Khawaajah Saahib and his followers out of the area for he felt that the Anasagar was being defiled since Hindus believed that bathing in it washes away sin. Hindus came from far and wide to bathe and take a little water home as Holy Water. The King sent Khawaajah Saahib an order leave the area and not to use the water of the Anasagar Lake for ablution. Khawaajah Sahibs ordered Khawaajah Qutb ud deen went to fill a water bag with water since they may not be allowed to utilize the water. Permission was granted and Khawaajah Qutb ud deen sat on the stair of the lake and filled the water bag. As he arose Khawaajah Saahib, through his Tasarruf caused all the water of the lake to fill into the water bag. If the goal is to imbue one’s self with Divine Attributes- to become Khalifaatul Laah actualized then the natural function is interference. This interference by man is possible on the lower level of physical science and at the higher level of spiritual science or spirituality. The Khalifaatul-Laah as one totally submitted to Allaah Kareem can do greater wonders than the physical scientist. Not a drop remained in the Lake and the pilgrims who had come from far off where amazed. The news spread like lightning that this Faqeer had used magic and filled the water of the Holy Lake into a water bag. The King commissioned the senior a Hindu Priest, Raam Deo to persuade Khawaajah Saahib to leave the area and to withdraw his magic or else they would come down hard on him. Ram Deo, the high priest and magician came and threatened Khawaajah Saahib. Khawaajah Sahib told him, ‘O! Raam Deo. I can see the light of Islaam on your forehead. Testify that ‘None is worthy of worship except the One True God and Muhammad is God’s Messenger”. Ram Deo fell at the feet of Khawaajah Saahib, began the Zikr of ‘He Is The Truth’ (Haqq Huu) and he recited the Testification Of Faith (Kalimaah). He was named Abdul laah. When the king was informed that his most senior priest, Ram Deo, has accepted Islaam, he was disturbed. The king sent a messenger to inform Khawaajah Saahib that he will allow him to utilize the water of Anaasagar on condition that he restores the water. Seeing children being deprived of water and also the kings pledge to allow the Muslims the right to use water, moved Khawaajah Saahib to reverse the situation. Khawaajah Saahib ordered that the balance of the water be put into the lake and it was filled once again. We believe this, but I have the writings of Maulvi Ashraf Alee Thaanvi in which he stated that the Walee of Allaah has the power to fill all the water of the river in a clay pot. He has also related similar miracles. Hindu historians have recorded the miracle of the Anasagar Lake and the acceptance of Islaam by High Priest, Ram Deo and 35000 Hindus on that day. At that time the Tanwara Family were prominent in Delhi, whilst the Chohaan Clan controlled Ajmer, in Gujarat the Baderia Clan were prominent and the ruling king at Lahore was Khusrau Malak, the last of the stars of the Ghaznavi Dynasty. The situation in India was such that many of the prominent kings, families and clans were becoming political rebels in their quest for power. The King of Delhi sent his nephew Pirthivi Raaj known as Rai Pathoraa to rule over Ajmer, since he had no children of his own. At that time, in Hindustaan, this area was the center of misbelief (kufr) and idol-worship. 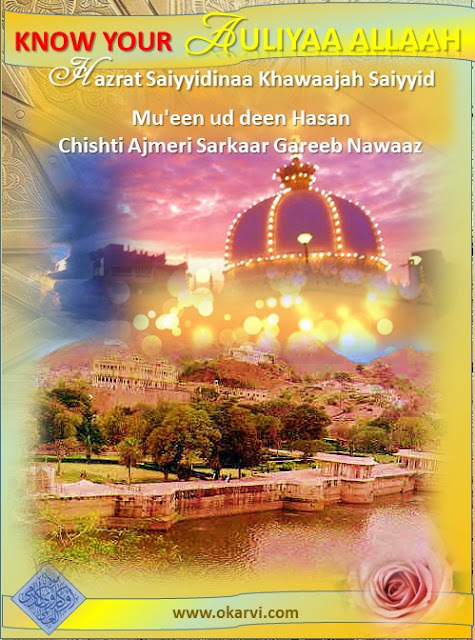 There were many temples in Ajmer, one of them being exclusively used by the King his wives and the ruling class. The poor were not allowed in this temple. The king, for the upkeep of this temple, donated the revenue of many villages. It is recorded that so many lamps burnt in that temple that daily large quantities of oil was utilized. Many were employed for is upkeep. So, Khawaajah Saahib came to settle in the hub of misbelief (kufr) and idol-worship. Khawaajah Saahib was about 52 years old [587 AH / 1191 AD] on arrival at Ajmer. He moved away from there and they seated the elephants on that spot. The following day when the attendants tried to get the elephants to stand, they remained seated and could not get up. This was because Khawaajah Saahib had said that the elephants should remain seated on their spot. Despite much prompting the elephants refused to stand. The entire city was abuzz that this Faqeer had cast a spell on the elephants. A crowd gathered to see who was this Faqeer. The king got wind of what had occurred and he dispatched some of his men to ask Khawaajah Saahib to withdraw whatever spell he had cast or else the elephants would die of hunger. They came to Khawaajah Saahib and pleaded with him to withdraw whatever spell he had cast. Khawaajah Saahib replied, ‘I have not cast any spell, the attendants troubled me so I commanded the elephants to remain seated.’ They pleaded to Khawaajah Saahib saying that he could remain on the land and he asked them to go for the elephants would now get up. The elephants did indeed stand up and the people were amazed and the entire city spoke of what had transpired...to be continued In Shaa Allaah. At the age of 9; he committed the Holy Qur’aan to memory. He was 16 yrs old when his father passed into the realm of Divine Beauty and he inherited a grinding stone and an orchard, which formed a source of his livelihood. A Madjzoub saint, Hazrat Ibraaheem Qandoozi (may Allaah Kareem be well pleased with him) paid Khawaajah Saahib a visit at his orchard. 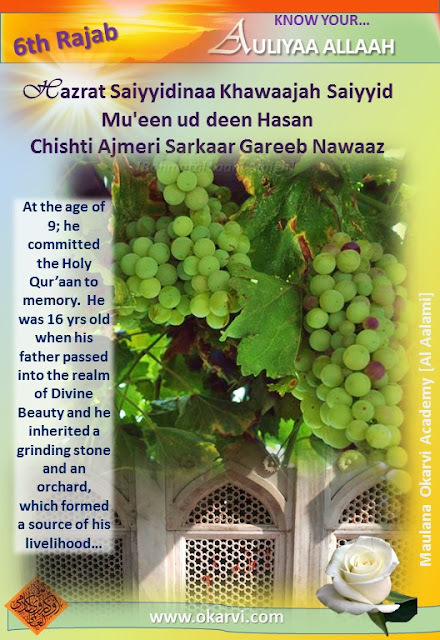 Being from a refined family background, even at this young age, Khwaajah Saahib knew what reverence and respect should be shown to the people of Allaah Kareem; he laid out a sheet [Chaadar] for Hazrat Ibraaheem Qandoozi to sit on and offered him a few grapes from the garden. Hazrat Ibraahem Qandoozi (may Allaah Kareem be well pleased with him) was pleased on seeing this respect and love that the young Hazrat Saahib had shown him and took out a piece of bread from his sack and chewed on it. He then took out the chewed bread from his mouth and placed it in Khwaajah Saahib’s mouth. An instant transformation occurred, in keeping with the Sunnah of the Holy Prophet (Peace be upon him, his family and his companions). The Madjzoub saint left. On eating the bread from Hazrat Ibraaheem Qandoozi (may Allaah Kareem be well pleased with him) Khawaajah Saahib penetrated the thin line separating the material world from the unseen: the inner organs of perception opened and so did his universe expand. The veil of worldly imagination was lifted from his mind and he found himself in quite a strange world radiating with divine manifestation. 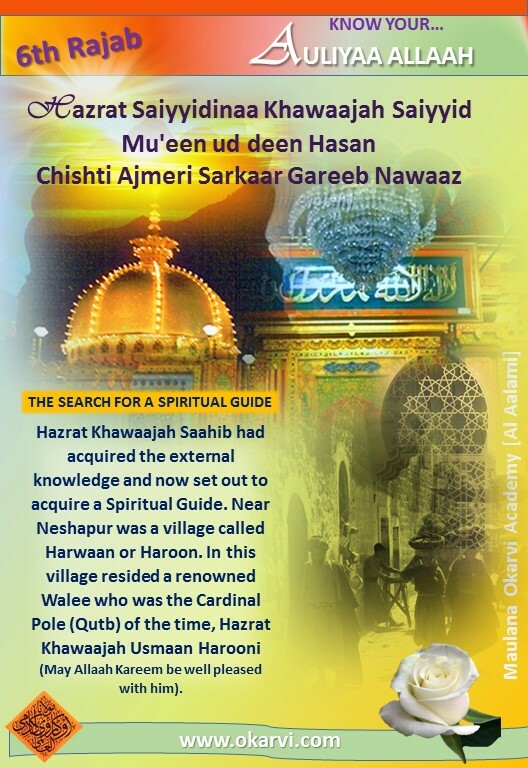 With this expanded view of the universe, Khawaajah Saahib went to his mother and related the encounter with Hazrat Ibraaheem Qandoozi at the orchard. He sought her permission to shed all material possessions and to dedicate his life to Allaah Kareem and His Holy Prophet (Peace be upon him, his family and his companions). to be continued-In Shaa Allaah!